WE’RE GONNA NEED A BIGGER BOAT. Actor John Magaro, above, portrays Wisconsinite Ervin Maske in The Finest Hours, a new film about a legendary Coast Guard rescue. Maybe it was humility. Maybe it was the aftereffect of trauma. Or maybe it was just old-fashion Midwestern reticence. In any case, Ervin Maske told his daughter almost nothing about his role in one of the most legendary rescues in U.S. Coast Guard history. That question will be in the minds of moviegoers around the world when they see the new Disney film The Finest Hours, an $80 million big-screen adaptation of a 2009 book with the same name, which chronicles what’s frequently called the greatest small-boat rescue in Coast Guard history. And it really was a small boat: Maske and three other Coast Guardsmen rode a 36-foot single-engine wooden lifeboat into 60-foot waves and hurricane-force winds off the coast of Massachusetts. It was virtually a suicide mission. “Please tell me we’re taking that boat to a bigger boat,” an anxious Maske, portrayed by actor John Magaro, says in the film’s trailer. Spoiler alert: Maske and his fellow Coasties survived, but not before braving a nor’easter of biblical proportions that lashed the East Coast on Feb. 18, 1952. The storm split in two a pair of ocean-going tankers – the Pendleton and the Fort Mercer – leaving their crews stranded in the storm. The film focuses on the rescue of the survivors aboard the Pendleton’s stern. 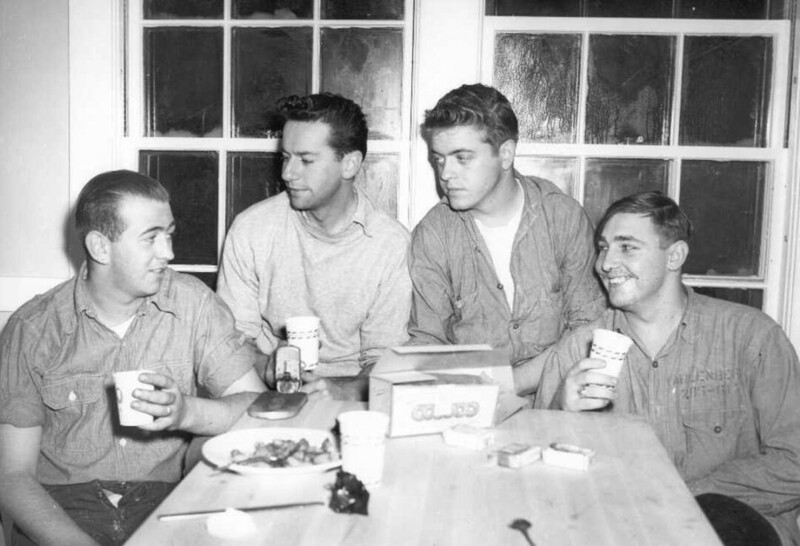 The real Maske (far right) with the three other Coast Guardsmen who conducted the rescue in 1952. His humility was a lifelong trait. Growing up in Marinette, Jevne knew little about her father’s experience. Occasionally, his buddies would ask to see his Gold Lifesaving Medal, the Coast Guard’s highest honor. “He’d say, ‘Oh, it was just a Coast Guard rescue. I saved some men. I just did my job,’ ” Jevne recalls. In the film, Maske is portrayed by 32-year-old actor John Magaro, whose other screen credits include The Big Short, which was recently nominated for five Academy Awards, and Not Fade Away (2012), directed by The Sopranos creator David Chase. The Finest Hours also stars Chris Pine (a.k.a. Captain Kirk from the latest Star Trek films) as Bernard Webber, who leads the lifeboat crew, and Casey Affleck as Ray Sybert, chief engineer of the ill-fated tanker Pendleton, whose men the Coast Guard tries to save. The four real-life lifesavers gathered with their families for a reunion in Massachusetts in 2002, which is when Anita and her brother, Matt, learned the full details of their father’s heroics. It was also there that the former Coast Guardsmen were interviewed by authors Michael Tougias and Casey Sherman. About four years ago, Jevne heard from one of the authors that Disney planned to turn the book into a film. In November 2014, she visited the film’s set in Quincy, Mass., where models of the Coast Guard station, the damaged tanker, and the rescue boat had been built in a huge warehouse. She came away with a few props as souvenirs and also had a chance to meet many of the film’s actors, including Magaro, who had previously chatted with her via Skype about her father. Since then, Jevne has anxiously awaited the film, curious to see how her father is portrayed. She got her chance on Monday, Jan. 25, at the film’s Hollywood premiere, which she attended as a guest of Disney. She also plans to attend a premiere of the film on Jan. 28 in Chatham, Mass., where the rescue occurred. 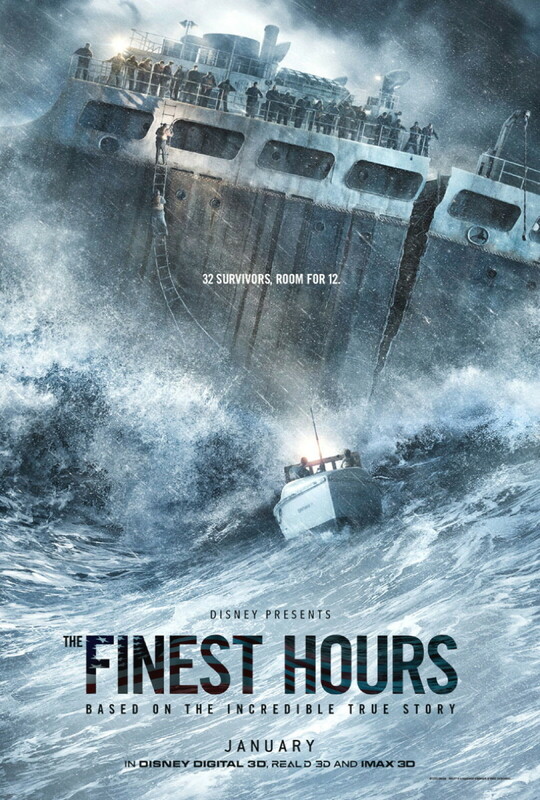 The Finest Hours is rated PG-13 and will open locally at 7pm Thursday, Jan. 28, at Micon Cinemas Chippewa Falls. Visit miconcinemas.com for details.